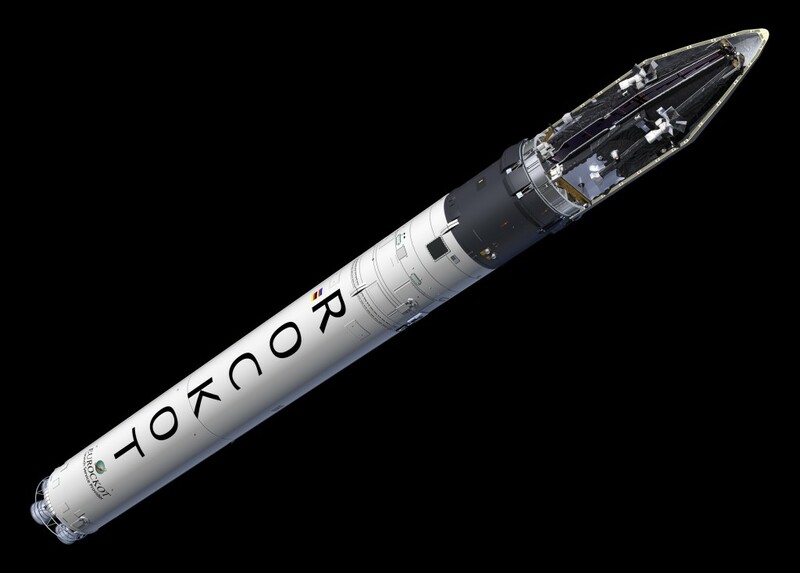 Rockot, also spelled Rokot, is a Russian orbital launch vehicle that can lift light and medium payloads to orbit. It is based on the UR-100N Intercontinental Ballistic Missile, also known as SS-19 Stiletto. Development of the UR-100N started in 1970 to improve the UR-100 ICBM by developing a larger missile that could lift heavier payloads. Flight testing was carried out between 1973 and 1975 and the system became operational in 1974. By 1978, a total inventory of 190 launchers was reached. An improved version, called UR-100UTTKh became operational in 1979 and started to replace older missiles, reaching a maximum inventory of 360 rockets. UR-100 missiles could carry up to six multiple independently targetable reentry vehicles with an operational range of 10,000 Kilometers. The missiles could be readied for launch within 25 minutes at any point in their 22-year storage life. UR-100 ICBMs are still in service today. After the Cold War ended, the UR-100 missiles were re-purposed by Khrunichev State Research and Production Center to be equipped with modern avionics and Briz-KM Upper Stages to serve as space launch vehicles. 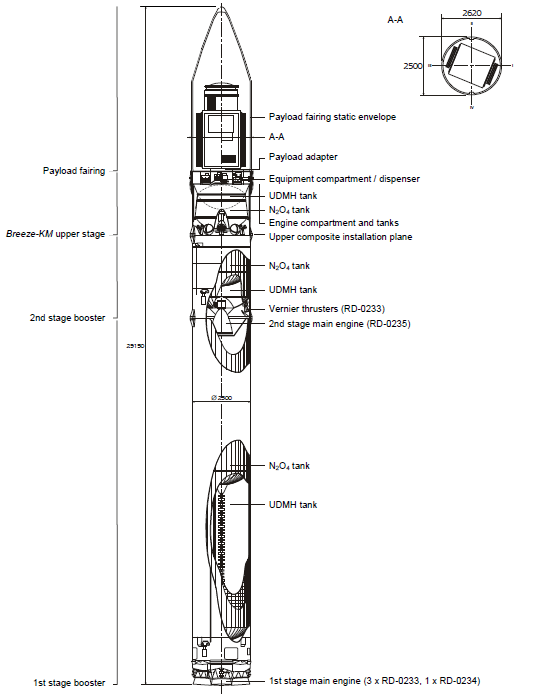 NPO Mash also re-purposed the UR-100 to serve as launch vehicle, but without the amount of modifications – creating a less flexible, but much cheaper rocket for small payloads going into Low Earth Orbit. In that configuration, the vehicle is known as Strela. Rockot made its first test flight on November 20, 1990 from the Baikonur Cosmodrome, Kazakhstan. The first orbital flight took place on December 26, 1994 and Eurockot was formed in 1995 to market Rockot for commercial launches. Eurockot bought 45 launch vehicles to build its inventory. In 2000, Astrium bought 51% of Eurockot’s shares. The Khrunichev State Research and Production Space Center holds 49%. 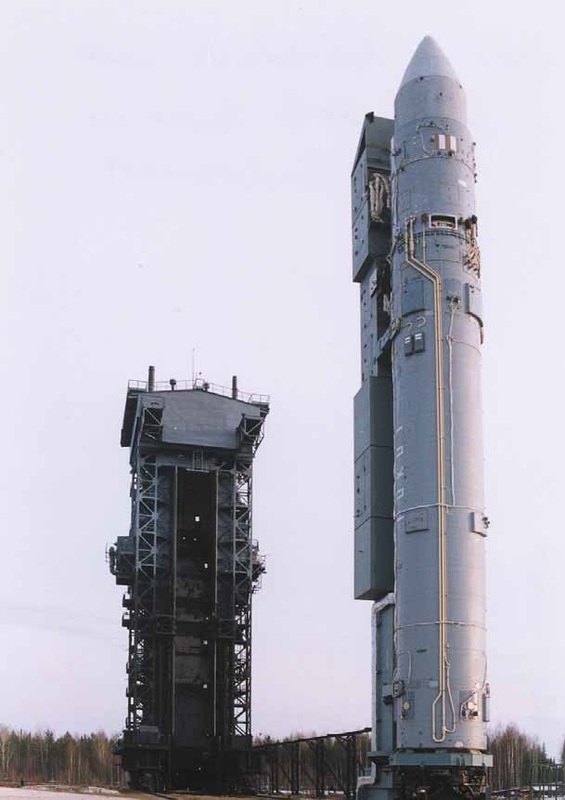 In May 2000, the first Rockot launched out of Plesetsk using a newly build launch pad instead of launching out of a silo like Rockot used to do in Baikonur. 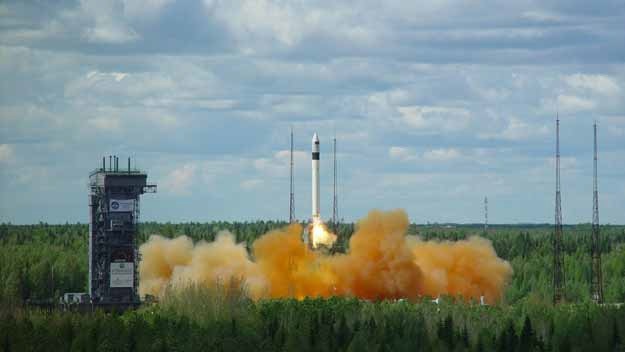 Rockot is a two-stage liquid-fueled launch vehicle, usually equipped with a Briz-KM Upper Stage, that is capable of delivering payloads of up to 2,140 Kilograms to Low Earth Orbit and 1,200 Kilograms of Payloads to Sun-Synchronous Orbit. The first stage of the Rockot Launcher is 17.2 meters long and 2.5 meters in diameter. It features the common design with the oxidizer tank containing NTO located above the fuel tank that is filled with UDMH. The two tanks share a common bulkhead to separate fuel from oxidizer. Stage 1 Liftoff mass is 77,200kg with an inert mass of 5,700kg. The first stage is powered by an RD-0232 propulsion unit comprised of three RD-0233 Engines and one RD-0234 Engine. The engines are similar in design, but the RD-0234 version includes a gas generator heat exchanger that supplies pressurant gas to the propellant tanks to keep them at proper flight pressure levels throughout first stage flight. All engines are turbopump-fed, closed-cycle engines. Each of the engines provides 470 Kilonewtons of liftoff thrust amounting to a total liftoff thrust of 1,870kN – 190,700 Kilograms. First stage vacuum thrust is 2,070 Kilonewtons (211,100 Kilograms) – 520kN er engine. First stage control is provided by Cardan-gimbaling the four engines individually. The first stage burns for 121 seconds. Stage separation between the first and second stage is accomplished in hot staging mode. The vernier engine of the second stage ignites ahead of stage separation. Special hatches on the first stage direct the exhaust of the four vernier nozzles to the outside. Once the pyrotechnic separation mechanism is initiated, the vernier exhaust pushes the spent first stage away. 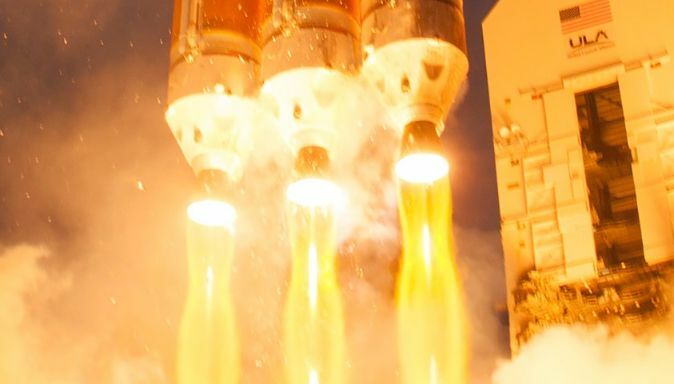 In addition, the first stage is equipped with four solid rocket motors that ignite after separation to move the first stage to a safe distance for second stage main engine ignition. The second stage of the Rockot Launcher is 3.9 meters in length and shares the first stage’s diameter of 2.5 meters. It has an empty mass of 1,500kg carrying 10,700kg of propellants. The NTO oxidizer tank again is located above the UDMH fuel tank and the two are separated by a common bulkhead. The second stage is powered by a closed-cycle, turbopump-fed main engine called RD-0235 and a four-chamber RD-0236 vernier engine for directional control. RD-0235 has a nominal vacuum thrust of 240 Kilonewtons (24,470 Kilograms) providing a specific impulse of 320 seconds. The main engine is fed and can not be moved. The RD-0236 vernier engine provides a total thrust of 15,76 Kilonewtons (1,607 Kilograms) and a specific impulse of 293 seconds. Each of the four nozzles of the vernier engine can be gimbaled along one axis to provide attitude control during second stage flight. Like the first stage, the second stage uses a hot gas system for tank pressurization. The second stage main engine burns for 183 seconds while the vernier fires for 200 seconds due to the earlier ignition for hot-staging. The Briz-KM is a modified version of the Briz-K that was originally built to serve as the upper stage of the Rockot launcher. Modifications were mainly focused on the structure of the stage to reduce its volume and make it suitable for multi-payload missions. 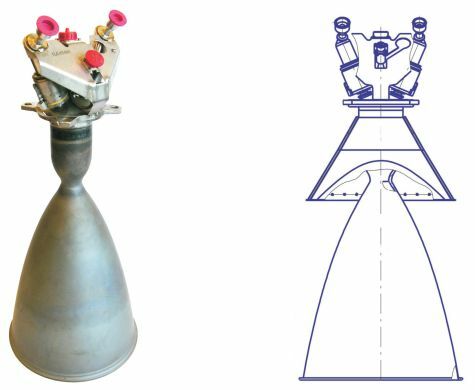 The stage consists of three main compartments – the propulsion compartment, the hermetically sealed equipment compartment and the interstage compartment that interface with the second stage of the launcher. Briz-KM is suspended in the extended interstage of the rocket that is a load-bearing system which also contains the necessary separation equipment. The payload fairing of the launcher is attached to the equipment compartment. Briz-KM is 2.6 meters long and 2.5 meters in diameter with an inert mass of 1,320 Kilograms. It features a different tank design with the UDMH tank located above the NTO oxidizer tank. The NTO tank is conical and outfitted with a recess to accommodate the main engine of the stage. Overall, Briz-KM can be filled with up to 1,665kg of UDMH propellant and 3,310kg of NTO oxidizer. High pressure Helium stored in tanks is used to keep Propellant Tanks at Flight Pressure and control the pneumatics of the Upper Stage. On top of the Central Block is the equipment section of the Briz-KM that is housed in an inverted truncated cone that features sub-frames to provide installation surfaces for the various controllers, telemetry modules, batteries and communications systems. Installed on the top frame of the Central Block is the payload adapter that provides the structural attachment point of the spacecraft and also includes communication interfaces. Payload adapters up to 2.49 meters in diameter can be supported. At the bottom of the Central Block is a 60-centimeter long adapter section that builds the structural interface between the Briz-KM and the second stage of the launch vehicle and also provides attachment points for the payload fairing to transfer loads from the fairing and house separation equipment. This interstage section is separated with the second stage. Briz-M is encapsulated in the payload fairing of the launcher and reduces the available payload envelope. 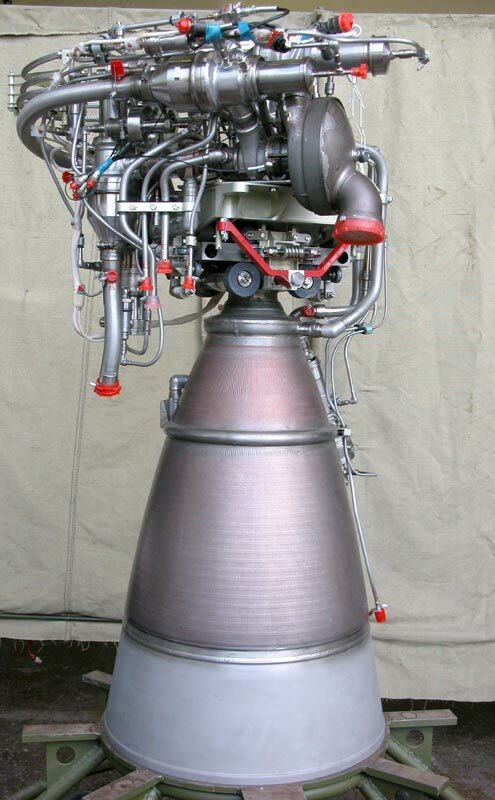 Briz-KM includes two propellant systems – one low-pressure system for the main engine and a high-pressure system for the settling thrusters and the attitude control system. Both use Unsymmetrical Dimethylhydrazine as fuel and Nitrogen Tetroxide as oxidizer. These hypergolic propellants ignite immediately when coming into contact. Briz-KM uses a single S5.98 main engine that delivers 19.62 Kilonewtons of thrust (2,000kgf) and is based on an open cycle design. In this propulsion scheme, a small amount of oxidizer and fuel are injected into a gas generator that creates a high-pressure hot gas consisting of combustion products. 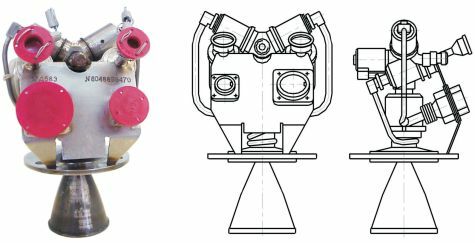 This high-pressure gas feed is used to drive the turbines of the turbopumps of the fuel and oxidizer to deliver high-pressure propellant components into the combustion chamber. 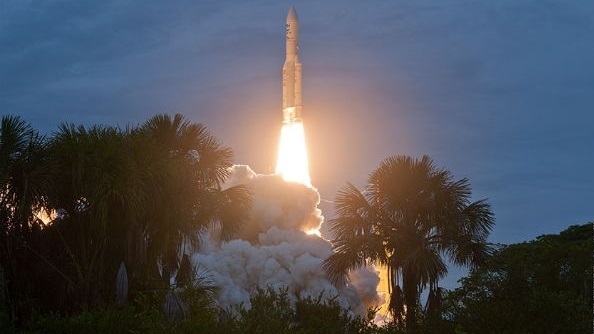 Regenerative cooling is accomplished by flowing propellant through the engine heat exchangers that cool the combustion chamber and warm up the propellants to temperatures where they have favorable physical properties. 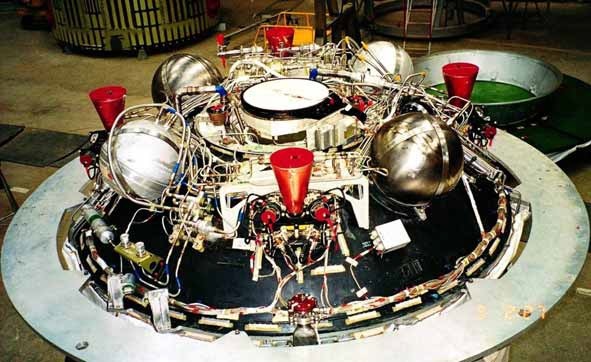 The attitude control thrusters used on Briz-KM are known as 17D58E providing a nominal thrust of 13.3 Newtons. Each unit is 14 centimeters long and weighs 550 grams. The thruster also operates at a mixture ratio of 1.85 and a nominal inlet pressure of 14.7 bar, but it can tolerate a large pressure range from 7.8 to 34.3 bar. For attitude control, the thrusters are used in pulse mode with a minimum on-time of 0.03 seconds, but 17D58E is also certified for burns in steady-state mode up to 10,000 seconds. The engine is certified for 450,000 duty cycles. 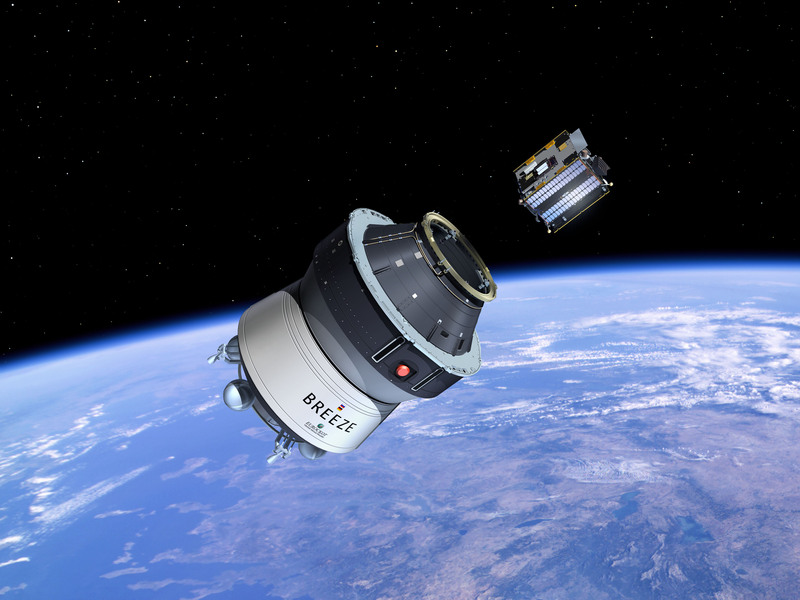 Briz-KM is outfitted with its own power system consisting of batteries and power distribution systems that allow the stage to operate for up to seven hours in orbit. The equipment compartment of the upper stage also includes a telemetry system with transmitters and antennas as well as tape recorders for store-and-forward telemetry capability. The Guidance, Navigation and Control System is in charge of controlling the flight throughout all phases. It consists of an inertial guidance platform featuring a 3-axis gyro system with onboard computers. The system is triple-redundant with majority voting. The GNC system is fully autonomous and not capable of command reception. 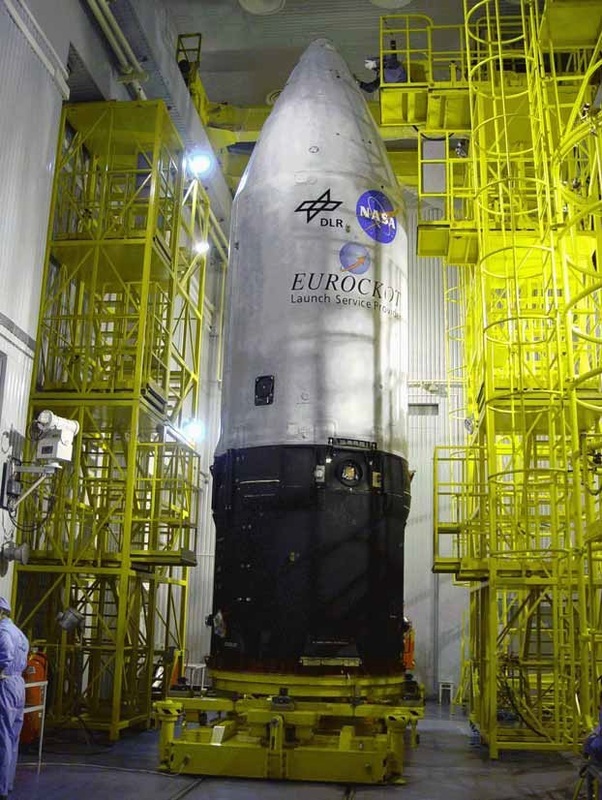 The Rockot payload fairing was specially designed for the commercial version of the launcher. It is installed on the equipment bay of the upper stage. The two fairing halves are 7.8 meters in length and when joined have an elliptical shape that is 2.5 by 2.62 meters in diameter. The usable payload envelope is 5.9 meters tall. The fairing protects the spacecraft against aerodynamic, thermal and acoustic environments that the vehicle experiences during atmospheric flight. When the launcher has left the atmosphere, the fairing is jettisoned by releasing mechanical locks that are holding the two half-shells together along the vertical split line via a pyrotechnic device located in the nose of the fairing. Following lock release, several pyrobolts on the horizontal split line are fired to enable the fairing to be moved sideward by spring pushers. Hinges on the fairing base ensure outward rotation and clean separation of the fairing. 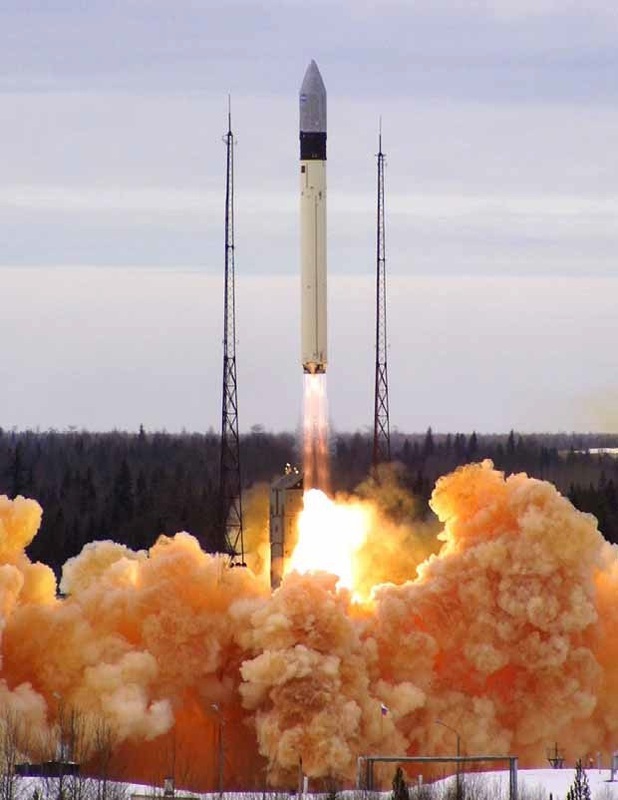 Instead of being launched out of a Silo like the SS-19 missile, the commercial Rockot uses a Transport and Launch Container in order to launch from a standard launch pad at Site 133/3 at the Plesetsk Cosmodrome, Russia. The Transport and Launch Container TLC facilitates the rocket while being stored. Rockot launchers are kept in storage for long periods of time, requiring the TLC to provide controlled climatic conditions and a Nitrogen atmosphere. Inside the TLC, the rocket is transported to the launch site and erected on the pad. The TLC facilitates equipment for pre-launch processing and environmental protections. Once the payload and upper stage are ready to be installed on the Rockot launcher, the TLC is extended to facilitate the upper stage, payload and fairing. TLC also includes interfaces for launch vehicle fueling as well as power and data lines. When the TLC is vertical, the launcher rests physically on a ring at the bottom of the TLC. Umbilicals between the launcher and TLC are separated by mechanical systems at liftoff. During the liftoff sequence, the launcher is guided by two rails inside the TLC before clearing the structure. The container protects the launch table environment from the engine plumes. The TLC is only used once.